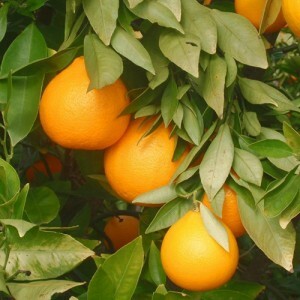 The Ambersweet Orange tree is a hybrid of the Clementine and Orlando Tangelo. Most Ambersweet fruits are medium-sized with a diameter of 2½ up to 3¾ inches. The color of both the peel and flesh is quite good for an early orange and makes the fruit quite appealing. The shape of the fruit is somewhat unique. It is tapered at the stem end with a slightly pear-like shape. The peel is thick and tends to be rather pebbly in texture. The Ambersweet offers ease of peeling and is good for eating out of hand. The Ambersweet Orange is cold hardy in USDA Growing Zones 9-11. It can be grown as a container plant in all other growing zones if it is brought indoors for the winter.